The air is crip and the trees are turning yellow. We had a wonderful summer but just like every year, Fall is upon us and it is lovely. For some it may be a little hard to embrace but what’s not to love when there are so much fall fun happening at the West Seattle Junction. From fall flavors to fall dresses, there’s something for everyone. To start with, fall dresses are back at Carmilia’s, and they will be super cute with boots from Clementine Shoes or a Edie’s. Halloween is also just around the corner so stop by Northwest Art and Frame and get some fun Halloween themed decor. Speaking of decorations, Capers is on the last week of their fall sale. 20% off on all furniture and up to 35% of on selected merchandise. Don’t miss it! 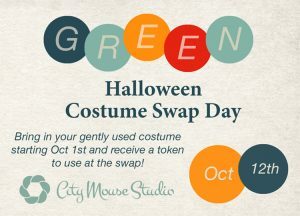 At City Mouse Studio, not only do they have their fall gear for the kids out, but there’s a big Halloween Costume Swap Day on October 12th. Bring only full costumes with no rips, damage or stains. Everyone who brings in a costume will receive a $5 City Mouse gift card. Fall colors come with fall flavors. Shoofly Pie has started the season with Pumpkin Pie and…wait for it… Apple Cranberry Crumble Pie! Oh the mouth that waters for the lovely sweets! Prepare your sweet tooth because it’s going to be a sweet ride at Cupcake Royale as they celebrate the season with 4 new flavors – Pumpkin Maple, Carrot Walnut, Chocolate Peanut Butter Pretzel, and new Praline Crunch. Sweet treats go with coffee so at Hotwire Online Coffeehouse, Blackberry and Swiss Chocolate Mocha or Pumpkin Caramel Latte are ready for anyone who wants to get their hands on a nice cup of coffee. 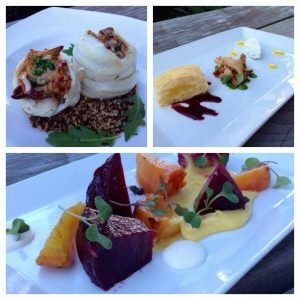 Finally, if you’re not into the sweet stuff, don’t worry, Fresh Bistro has their new fall dinner menu out and they’re making us drool over their Foraged Mushroom Stuffed Sole Filet, Deconstructed Mushroom Tart, and Roasted Beet Salad. The photo is just a glimpse of what’s to come.